Christmas Beers for my favorite time of the beer! 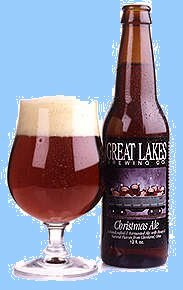 Great Lakes Christmas Ale: Still my favorite after all these years. I pick up at least a six pack every year. You should too if you really like beer. Abita Christmas Ale: A very good Christmas Ale that will appeal to even the most limited beer palate. Safe for your friends who think Bud Light is a really good beer. Anchor Holiday Ale: A rich Christmas Ale. It’s so rich you won’t be able to drink more than one. Crooked River Yuletide Ale: This was the beer that changed my palate. Read the review you’ll understand. It’s been a long time since then. Unfortunately, this tasty brew is no longer available. Goose Island Christmas Ale: Liquid smoke in a bottle. If you like that, you’ll enjoy this beer. I didn’t. It took me a long time before I was willing to try another Goose Island beer. While I was at the beer temple, I also picked up some Bell’s Christmas Ale. I’ll let you know how that is after I finish the GLCA. If I didn’t have to work tomorrow, it would be in couple of hours. I’ll have to stop at three .